Of the six Haydn sonatas published as Opus 14 in 1776, this one is generally held to be the best. 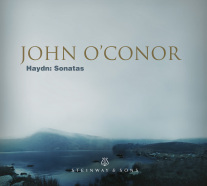 These sonatas forsake some of the grandeur of Haydn's remarkable keyboard works of the early 1770s, and may have been tailored to the modest abilities of Haydn's princely patron. Nevertheless it is quite a distinctive work. The opening theme of the first movement is stamped with affirmative runs and thumping bass chords. The development is frenzied, with a strong streak of the sardonic and even of rage. It is restless to the very end. The minuet is either very naive or very clever. The outer parts consist of typically elegant minuet music, but the central trio is aggressive and has a sinister edge. The last movement would not have disgraced the young Beethoven. It has fortissimo octaves and an insistent repeated-eighth-note rhythm. There is a short passage in which the music relents slightly from its impulsive drive and then crashes on to a stormy finish.